Posted on Jul 20, 2015 by Appleton Downtown Inc. The focal point of The Alley Project is a mural designed by noted artist Chad Brady. Although the alley is temporary for Mile of Music, the mural will have a two-year lifespan painted on the wall of the museum’s Ogilvie Preservation Center. Learn more and support The Alley Project here. Chad is creating a mural that incorporates elements of the outdoors and active living to celebrate how we engage the natural landscape of the Fox Valley Region. The primary theme focuses on the simple pleasure of riding a bicycle and how that can connect people to the outdoors. 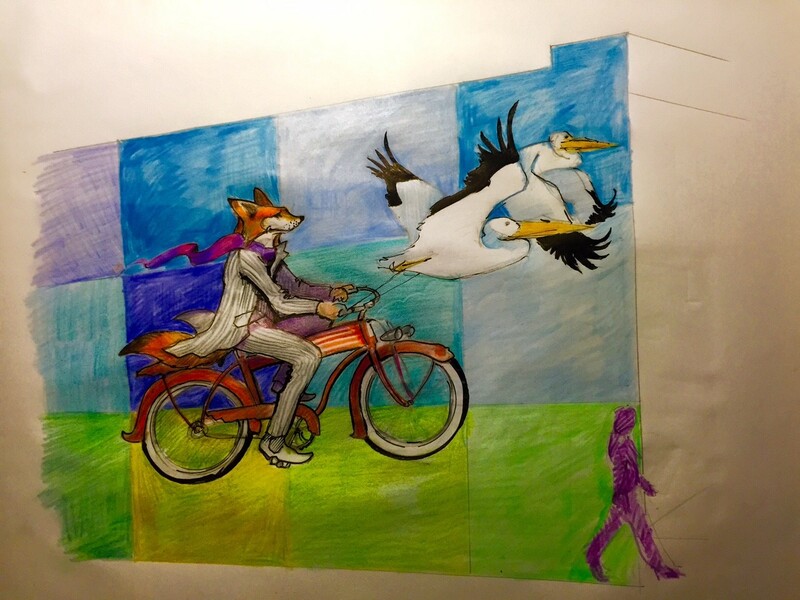 To tell this story, Chad’s preliminary whimsical design includes a fox wearing a tuxedo who is riding a vintage fat tire bicycle. The bicycle is being carried through the air on strings pulled along by a flock of pelicans. Part of the design will include lighted elements for the weekend of Mile of Music. The light show will be projected from the second floor of the former bank. Wisconsin has a long love affair with the bicycle that dates back to the state’s first ride in January 1869. The state has also produced the first rails-to-trail program, manufacturers of leading bicycle brands, notable racers, national advocates, and many people who incorporate cycling into their daily lives. All of this will be celebrated in the museum’s next exhibit – Shifting Gears: A Cyclical History of Badger Bicycling (opens November 2015). This event will be our public launch of the coming exhibit. The mural will also compliment Appleton’s hosting of the Wisconsin Bike Summit organized by the Wisconsin Bike Fed in November 2015.